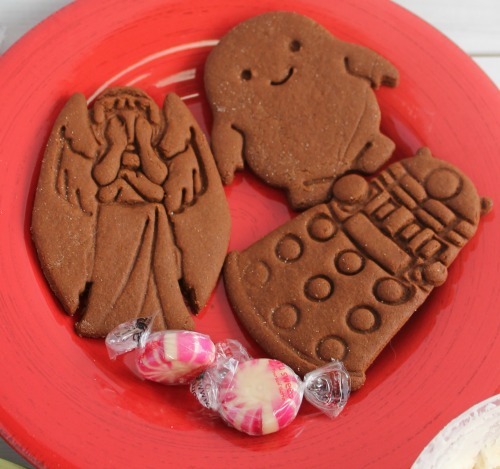 Biting The Hand That Feeds You: Happy Who-lidays - The Doctor Always Wanted to be a Ginger...bread Cookie! 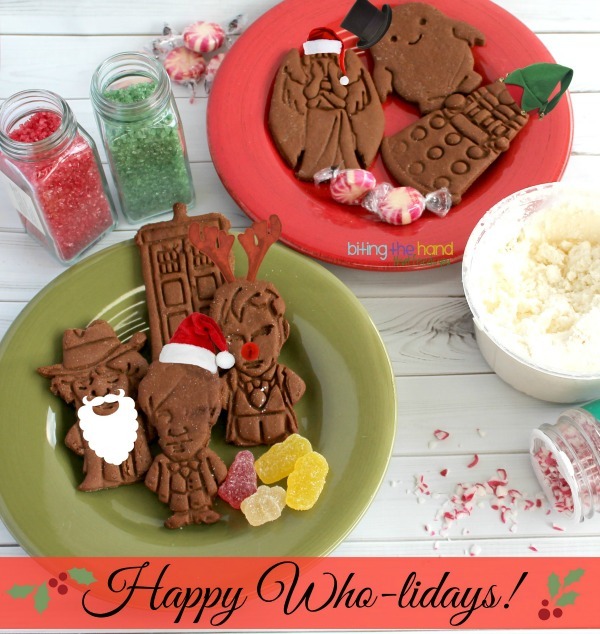 Happy Who-lidays - The Doctor Always Wanted to be a Ginger...bread Cookie! For the last day of school before the break, I needed to whip up some "safe" gingerbread cookies for the holiday party in the afternoon. 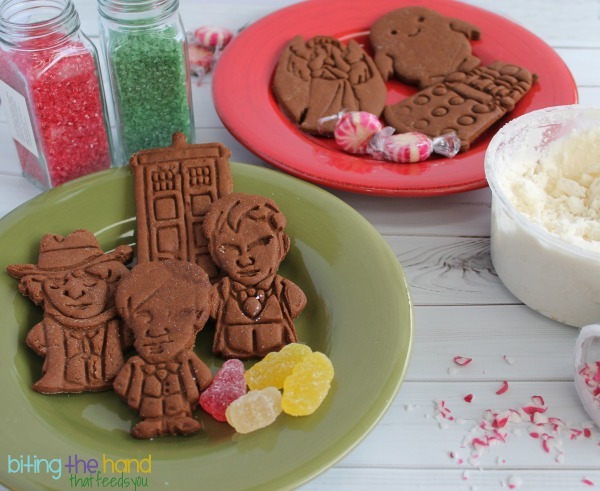 Since regular gingerbread people are boring, I made some with a little more Who-liday spirit, with cutters from Warpzone Prints! And what better way to celebrate today's Doctor Who Christmas special, say farewell to Matt Smith, and welcome the new "ginger" Doctor, Peter Capaldi! Omnomnom! 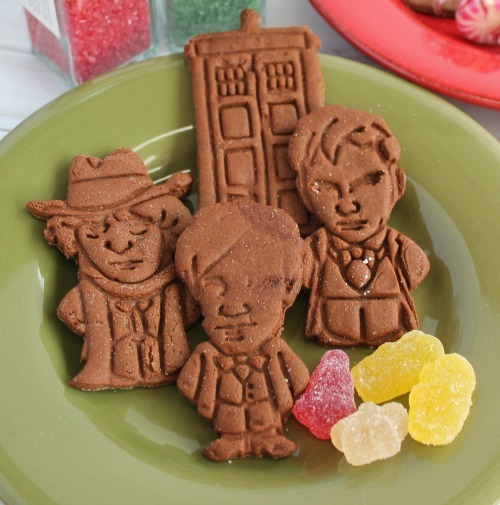 Shown here are cookies using the Eleventh Doctor (Matt Smith,) Tenth Doctor (David Tennant,) Fourth Doctor (Tom Baker,) and TARDIS cutter. 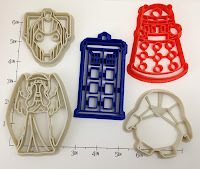 Some fun cookies using the Adipose cutter and Weeping Angel and Dalek cutters! Sift all dry ingredients (except sugar) together and set aside. Cream butter and sugar (or 1/4 c cookie mix) on high speed for 3-5 minutes until light and fluffy. Place dough between two sheets of parchment paper or plastic wrap lightly dusted with rice flour. 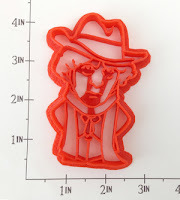 Roll out to 1/8" thick. 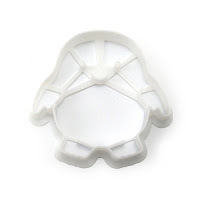 Dip cookie cutter(s) in rice flour and cut out cookie shapes. Use a flour-dusted spatula to transfer cookies to parchment-lined baking sheet. Note: If dough gets too soft or sticky as you are working with it, place in freezer for 5 minutes. 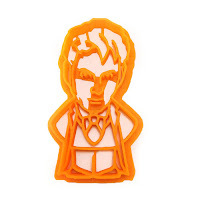 Bake for 10 minutes in preheated oven, or until cookies are firm to the touch. Cool and decorate. I have an extensive collection of dye-free food color, candy, and sprinkles, but shown here are natural food color sugar sprinkles, Confectious peppermint sprinkles, Surf Sweets holiday gummies (vegan, dye-free, nut/peanut-free,) and TruSweets peppermints. 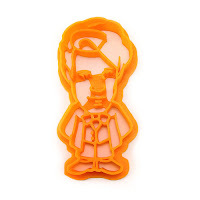 These are available on Amazon, Natural Candy Store, and Chocolate Craft Kits, as well as in-store at Whole Foods and other natural grocery stores. For more Who-liday fun, check out this "Spoilers" lunch from What's In Our Lunch Bags, and "Don't Blink" from Bent On Better Lunches! Yummy! These turned out great! !